Eschewing the usual approach to marketing games and, perhaps heeding recent research boomers are the new black, Nintendo has introduced and is marketing a game called Brain Age and is positioning it as a means to exercise the mind and keep one sharp. Writing in MarketingProfs, Karl Long says, "Nintendo is essentially turning market perception on its head, positioning the video game as positive 'mental exercise,' as opposed to the common perception of it being a pointless, mind-numbing activity." 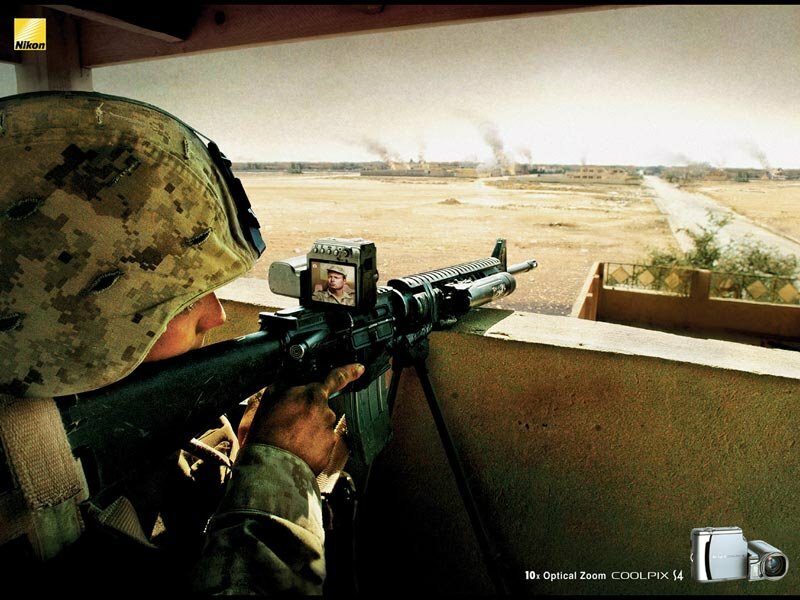 Following in the boundary-pushing footsteps of the Schering baby-in-a-dumpster ad comes this Thialand ad for the Nikon Cool Pix S4 which uses military gun site imagery to convey the effectiveness of Nikon technology. Surely and ad that would never run in America but, apparently, the rest of the world has dispensed with this thing called political correctness. There's an interesting conversation going on in the Adrants forum about the recent death of several magazines and the effect the Internet is having on the magazine industry. Some feel the physical nature of the magazine and the impracticality of the laptop making its way into the bathroom or to the beach will keep magazines alive. Others feel the connected teen has no need for paper nor the patience to way for what can be had instantaneously online. Visit the forum here. It looks like all those twenty-something hipster agency creatives might have a tough time identifying with their client's target audiences over the next ten years. Remember those people we called Yuppies? Or baby Boomers? Well, that audience, which owned the 80's with their yellow ties and Wall Street aspirations is about to boot advertising's fave demographic, 18-49, to also-ran status. Results released yesterday from Survey Sampling International review of Census data notes 78 million baby boomers will turn 50 over the next ten years increasing the size of the 50+ demo from 89.3 million in 2006 to 111.3 million in 2016, a 25 percent increase. In contrast, the 18-49 demo, while still larger overall, will see a measly one percent increase in size from 135.1 million in 2006 to 135.9 million in 2016. Hearing Joe Jaffe talk about the three C's of consumer created content with Pete Blackshaw and Jackie Huba on his Across the Sound podcast, we were reminded of having once said to a male co-worker in front of a female co-worker in reference to something completely business-related and without regard to the the female co-worker's very curvaceous figure, "three D's are better than one." Needless to say, awkward smirks and giggles followed. Thankfully, that wasn't the case after listening to this week's Across the Sound podcast which discussed the many aspects of consumer created content, consumer generated media, citizen's media or whatever label you want to place on the trend.